The Ring Road wasn't always going to be this way. This page charts the chain of events that led to the creation of what is perhaps Britain's most bizarre ring road. It was written with copious help from Peter Binnersley, who provided much of the information. The Ring Road plan came about after the Second World War when Coventry was left with a blank canvas to regenerate its city centre. In 1946, the route was effectively to follow the current line, but was to be a dual carriageway with parallel cycle paths, broad swathes of parkland on each side and nine roundabout junctions. It was only when work was closer to starting in the very early 1960s that engineers claimed that it could — despite everything that was then known about the layout of grade separate roads — be grade-separated. The evidence was a Road Research Laboratory report on the function of roundabouts, which modelled them as a series of weaving sections — so each carriageway was to be treated as one huge roundabout. The Ring Road today stands as a testament to what happens when you damn well get on with a scheme and finish it. Any number of cities have a 'ring road' that isn't finished — Glasgow has half, Leeds has two unfinished rings, London has one and a half of its planned four. The moral of the story? Coventry didn't procrastinate! The road as it stands today has some interesting idiosyncracies — each individual section is "Ringway St John's", "Ringway Swanswell" and so on, but the whole route is always called the Ring Road. 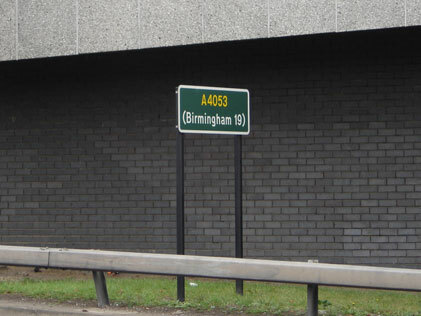 It is a primary A-road, the A4053, but its number is a complete secret on the road. It gained junction numbers (signposted, unusually, in white on red, not white on black) towards the end of the 1980s. Perhaps the most salient point is that, despite what appears to be an awful, dangerous, unworkable design, it all works remarkably well! "The carriageway curves were designed using a Fortran program written by the city architects when the department purchased its first computer back in the 1960s. The curves were designed for the helter skelter speed of 40mph, not thought to be a routine speed at the time! "The section from Parkside through to Coventry station [junctions 4-6, the part of the circle that is bent inward] was originally intended to be further out so that the station was within the ring road (I met someone who used to work in the City Surveyors and he had seen the original drawings). The Council at the time was Conservative run and the proposed route was changed to prevent councillors having the road in their back gardens and disturbing King Henry School! The route was changed but the calculations done above were not redone to compensate, hence this section always feels a bit more scary at speeds above 40mph!" Does this also explain the unusual layout at J4 where the ring road turns an extremely sharp corner? "I don't know whether you are aware, but plans are afoot to demolish at least part of the infamous Coventry Ring Road. It's all part of a regeneration scheme; if it does happen it will mean this part of the Ring Road stood for barely 40 years and in constructing it they demolished some lovely, characterful old buildings. Planners? As my dad would say, I wouldn't pay them in washers." This is terrible! The Ring Road must be saved!